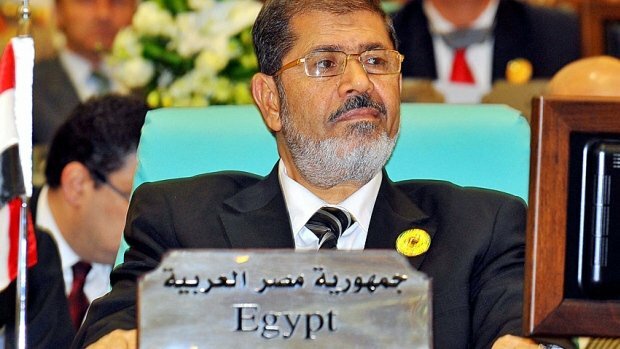 Egypt’s ousted President Mohamed Morsi has arrived in court in Cairo where he is due to go on trial, state media say. Mohamed Morsi and 14 other Muslim Brotherhood figures face charges of inciting the killing of protesters in clashes outside the presidential palace. Security services are on high alert after supporters of the former president called for major protests. Mohamed Morsi was ousted by the military in July after protests against his rule. According to state TV, Mohamed Morsi arrived at the courtroom, inside the Police Academy in Cairo. Other key Brotherhood figures, Essam el-Erian, Mohammed al-Beltagi and Ahmed Abdel Aati are also there. While Mohamed Morsi was airlifted into the compound by helicopter, other defendants were said to have been brought in by armoured personnel carriers. The ousted president was seen from a distance in civilian clothes, Egyptian radio reported. This is his first appearance in public since he was ousted on July 3. The trial had been due to take place at Tora prison on the other side of Cairo but had been switched late on Sunday, apparently to deter protesters. Shortly after Mohamed Morsi’s arrival, a small crowd arrived and began chanting outside the sprawling police compound more than one hour’s drive from the centre of the city. The crowd soon grew to number some 200. Although Mohamed Morsi won the presidency in a democratic election, during his 13 months in power he fell out with key institutions. The ex-president is accused of “incitement to murder and violence” over the deaths of at least 10 people during intense clashes in December 2012 which followed a decree that gave him wide-ranging powers. After he was ousted, a sit-in protest in Cairo by Mohamed Morsi’s supporters was violently broken up by the military, leading to the deaths of hundreds of people. The interim government has also cracked down on the Muslim Brotherhood, from which Mohamed Morsi hails, banning the Islamist organization and arresting dozens of senior figures. His supporters say he was removed in a coup and is now facing a politicized trial. Human rights groups accuse the security services of acting without accountability. Mohamed Morsi and his co-defendants are expected to use the trial to underline what they see as the illegitimacy of their ousting. There is considerable interest in Egypt in whether the authorities decide to televise the former leader’s appearance in court.